﻿Taking the sting out of Texas’ much-maligned scorpions. ﻿﻿﻿﻿﻿﻿﻿﻿﻿Deep inside a wild cave near Austin, I search for something that most people find abhorrent: scorpions. These creepy-crawly arachnids frighten and fascinate us with their crablike pincers and barbed tails. Notorious for their painful sting and noxious venom, they sometimes invade our homes and even our nightmares. It’s unlikely you will find the scorpion I’m looking for — the Texas cave scorpion (Pseudouroctonus reddelli) — in or around your home. These dark-colored, troglophilic scorpions dwell in caves, grottos and other limestone karst features along the Balcones Escarpment. Matt Turner, a board member of the Texas Cave Management Association, and Peter Sprouse, a longtime Austin caver, karst invertebrate expert and environmental consultant, guide me through the cave. Turner spies a cave scorpion near the entrance, giving me pause as I slither feet first into the cave. The tight passage opens up and slopes down to a bedroom-sized chamber decorated with gleaming cave formations. ﻿Peering under rocks and in crevices, Sprouse and Turner spot several P. reddelli with their headlamps while I illuminate them with an ultraviolet (UV) flashlight. Scorpions are the only arachnids known to fluoresce under black light, an unusual trait enabled by fluorescent chemicals in their exoskeletons. Scientists have studied scorpion fluorescence since the 1940s, but a definitive explanation of the phenomenon remains elusive. Recent theories suggest fluorescence plays a role in detecting and avoiding damaging light, attracting insects or even engaging in intraspecies communication, since scorpions can see each other’s fluorescence. Other researchers posit that fluorescence serves no purpose at all, that it’s just random evolution. Sprouse finds a large adult scorpion on the cave floor, and it glows an eerie teal-green under UV light. I expect it to scurry away, but it remains motionless. Patient, opportunistic predators, Texas cave scorpions feed primarily on cave crickets, and despite their fearsome appearance, they are reclusive creatures that lash out only if accosted. 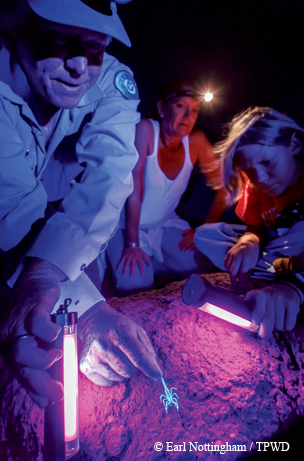 ﻿Barton Warnock Visitor Center Superintendent David Long and West Texas visitors use black lights to find scorpions on a moonlight tour. P. reddelli is one of two scorpion species occurring in Central Texas. The other, Centruroides vittatus, commonly known as the striped bark scorpion due to the dark stripes on its tan carapace, ranges widely across Texas, the midsection of the United States and northern Mexico. A medium-sized scorpion, C. vittatus lives in trees, shrubs, leaf litter, grasses, wood piles, desert floors, rocky areas and, occasionally, our homes. According to David Sissom, a biology professor at West Texas A&M University, there are about 1,500 known scorpion species worldwide, and the species count continues to grow as experts discover and classify new scorpions. More than 90 scorpion species live in the United States, including 18 described species in Texas. West Texas harbors 17 species; the Texas Panhandle, five; southeastern Texas, including the Lower Rio Grande Valley, four; Central Texas, two; and the rest of Texas, only C. vittatus. Scorpions exist on all major landmasses except Antarctica, in terrestrial habitats ranging from deserts to tropical rainforests to temperate zones, and from below sea level to elevations up to 14,000 feet. 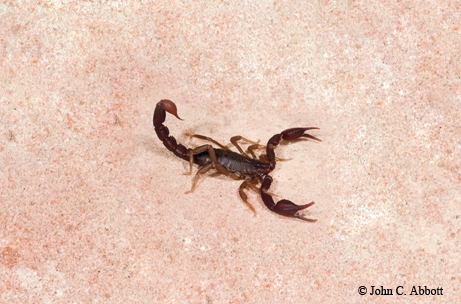 The greatest scorpion diversity occurs in deserts and semi-arid environments. Big Bend National Park, for example, is home to 15 species, and Baja California, a scorpion hot spot, hosts more than 60 species. Scorpions are eight-legged arachnids related to spiders, harvestmen, ticks, mites and whip scorpions. Often called “living fossils,” scorpions date back 440 million years in the fossil record to the Silurian period. These ancient scorpions were aquatic arthropods that lived in swamps and estuaries and breathed through gill structures instead of the “book lungs” found in today’s scorpions. Similarities between fossil and modern scorpion bodies suggest they have changed little over geologic time, although some scorpion ancestors grew up to a meter in length, dwarfing today’s species, which vary in head-to-tail length from one-third inch to more than 9 inches. How and why scorpions emerged from the oceans millions of years ago to become terrestrial and predominantly desert-dwelling creatures remains a mystery. Despite their ability to thrive in arid habitats, scorpions — like all life forms — need water to survive. Accordingly, they have evolved very watertight bodies with thick, waxy layers of cuticle to conserve water. 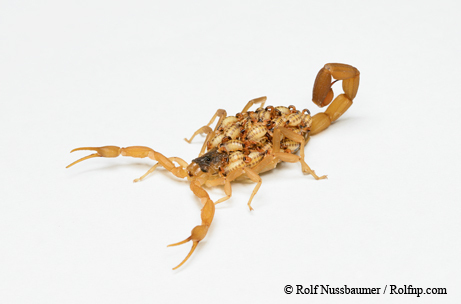 ﻿﻿After birth, scorpion babies crawl up on their mother’s back and ride there for up to three weeks. “Scorpions exhibit some of the lowest evaporation rates of all animals, and they get much of their water from their prey,” says Sissom. Scorpions also have inactive “slacker” lifestyles and some of the lowest metabolic rates in the animal world, enabling some species to survive up to a year without food. Consummate nocturnal predators, scorpions hole up during the day in burrows, in crevices or beneath rocks to conserve moisture and avoid sunlight and heat. They emerge at night to hunt and feed on a diverse arthropod menu of insects, arachnids and other scorpions. Larger species even prey on lizards, snakes and mice. Like spiders and other arachnids, scorpions ingest food in liquid form. They use sharp, protruding jaw-like structures (called chelicerae) to break up prey into manageable pieces, which they hold with their pincers (or chelae) at the end of arm-like pedipalps. Then they eject digestive juices to liquefy bits of prey into a smoothie of predigested food. Scorpions have up to a dozen eyes (one pair on the top of the head and other pairs on the front edges of the head) and use eyesight to navigate and detect objects around them, even by starlight. They also navigate and find prey and mates by using sensory hairs and a pair of comb-like sensory structures (called pectines) between the last pair of legs. All scorpions produce venom and use it to immobilize or kill their prey and to defend themselves against predators. The scorpion’s segmented tail, or metasoma, is armed with a formidable telson containing venom glands and a barb that pierces and injects venom like a hypodermic needle. A complex cocktail of neurotoxins, organic compounds and tissue-penetrating enzymes, scorpion venom varies in potency from relatively mild to excruciatingly painful, even potentially deadly. I was stung once by a scorpion (most likely C. vittatus) while gathering firewood — a sharp burning sensation similar to a wasp or bee sting. Most scorpion stings inflict localized pain and swelling that may subside in an hour or two and can be eased with a cold compress and analgesics. Of the estimated 1,500 known scorpion species, only 25 to 30 pose a lethal threat to humans. Fortunately, there are no medically dangerous scorpion species in Texas. The most venomous scorpion in the United States — and the only U.S. species reported to have caused fatalities — is the Arizona bark scorpion (Centruroides exilicauda), a more potent relative of C. vittatus that lives in the Sonoran Desert, not Texas. If you travel to Mexico, watch out for scorpions. Mexico harbors some of the world’s most dangerous scorpions, including several nasty Centruroides species. Scorpions sting an estimated 100,000 people a year in Mexico, resulting in up to 800 deaths annually. “There is a significant issue with scorpion mortality in Mexico, and dangerous species also occur in Central and South America, the Middle East and Africa,” Sissom says. Envenomation from dangerous species often requires antivenin treatment to ease breathing difficulties, paralysis and convulsions and to prevent death. Children, elderly people and those with weak immune systems are the most at risk to die from scorpion stings. Paradoxically, scorpion venom can help save lives. Chemicals in the deathstalker scorpion’s venom show potential for treating brain tumors and regulating insulin to help treat diabetes. Some scorpion toxins have antimicrobial properties that may spur the development of new antibiotics, while others act as immuno-suppressants for treating autoimmune disorders. Despite their venomous stings, scorpions are remarkable creatures. Scorpion courtship reminds me of a wild night of two-stepping at a Texas honky-tonk. First, the male and female find each other through pheromones and vibrational communication. Then the male grasps the female’s pedipalps, and they begin an elaborate dance called a promenade à deux as the male leads the female around and around for about 30 minutes while searching for a suitable place to deposit his spermatophore to fertilize his mate. Scorpion gestation ranges from two to 18 months. Unlike other arachnids, which are oviparous (egg-laying), scorpions are viviparous, giving birth to live young. Female scorpions also display maternal behaviors as they feed and protect their young. After giving birth, the mother carries her offspring on her back until they undergo their first molt. Some scorpion species like C. vittatus live for three to five years, while others, such as the giant desert hairy scorpion (Hadrurus arizonensis) of the Sonoran and Mojave deserts, may live 20 to 25 years in the wild. Scorpions and humans have crossed paths since the dawn of mythmaking. More than 4,000 years ago, Babylon­ian astronomers identified Scorpio as one of the 12 constellations. The eighth sign of the Zodiac, Scorpio embodies strength, passion and jealousy. Ancient Egyptians venerated the scorpion as sacred to Isis, the goddess of rebirth. In Greek mythology, an avenging scorpion killed Orion, the son of Zeus. Scorpion references appear in the Egyptian Book of the Dead, the Epic of Gilgamesh, the Talmud and the Old Testament. Scorpions also figure in North African, South Asian and Latin American cultures, representing both evil and protective forces. Today, scientists, not shamans and astrologers, study the secret lives of scorpions to understand the vital roles they play in our ecosystems. We need scorpions infinitely more than they need us. As a charismatic flagship species, scorpions are vital to the equilibrium of our food webs. Many scorpion species have specific micro-habitats and ranges, and their disappearance in the wild sends a distress signal of habitat degradation that ultimately will affect all forms of life, including humans.